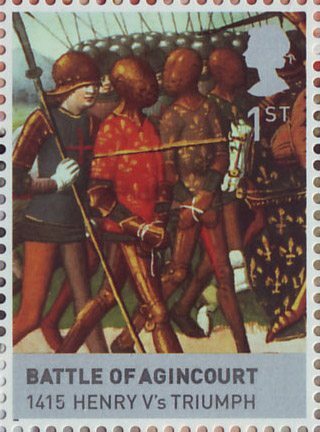 October 2015 marks 600 years since the Battle of Agincourt, a major English victory in the Hundred Years War. It saw the superiority of English archers defeat the French knights, leading to a unification of the two countries. Stamps are an expressive way to remember and commemorate historic battles and I have chosen just a few to document the terrains of war faced by the British throughout history. First we will focus on land. 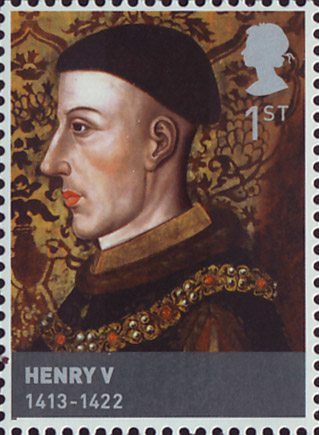 Henry V’s men were greatly outnumbered at Agincourt, however the narrow battleground prevented large scale manoeuvres benefiting the English. Their innovative use of the longbow also kept the progressing French at bay. The defeated French Knights can be seen in the below stamp taken from the illuminated manuscript ‘The Vigil of Charles VII’ c.1484. After the battle Henry married the French King’s daughter Catherine of Valois and their children were acknowledged as heirs to the throne. 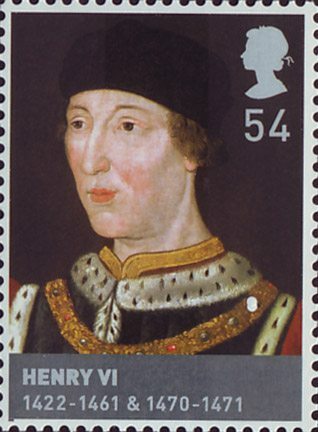 It was their son Henry VI who would become King of both England and France. As an island nation we have always been under threat from invasion by sea. The Battle of Trafalgar in 1805 saw 27 British ships defeat 33 of the combined forces of France and Spain. It was here that Admiral Lord Nelson’s unorthodox tactics confirmed British Naval supremacy. Nelson decided that instead of attacking the enemy ships parallel, which awarded a greater target area, he would attack straight on. By moving two smaller groups forward perpendicular to the enemy he was able to split their line. This formation can be seen in the above stamp from 2005. 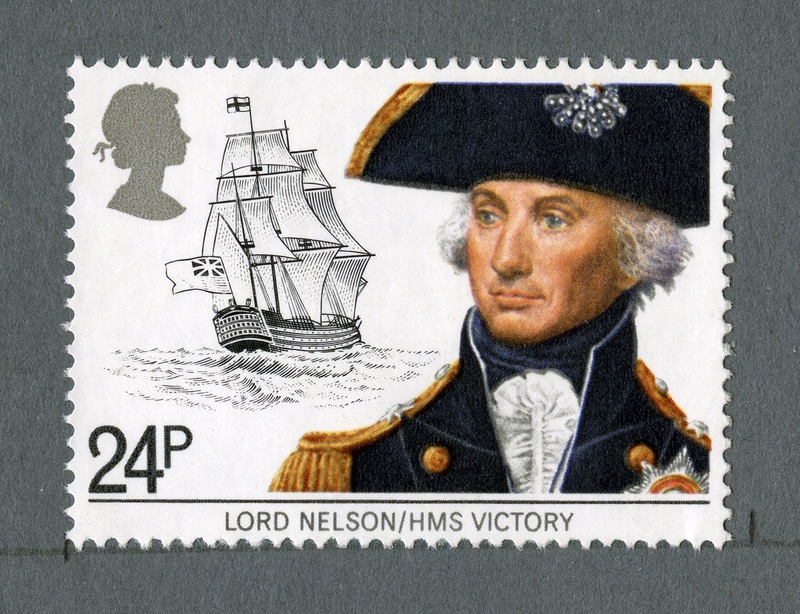 Though a tremendous victory, it saw the death of Nelson who was mortally wounded aboard his ship the HMS Victory. This event was immortalized in numerous paintings like the one depicted in the stamp above. Nelson’s body was brought back to England in a cask of brandy, where he was honoured with a state funeral. With the advancements in technology the new danger to the nation came from the sky. 2015 also celebrates the 75th Anniversary of The Battle of Britain, the first campaign to be fought predominately in the air. Below you can see an image of ‘The Few’, the name given to the boys who defended their country. 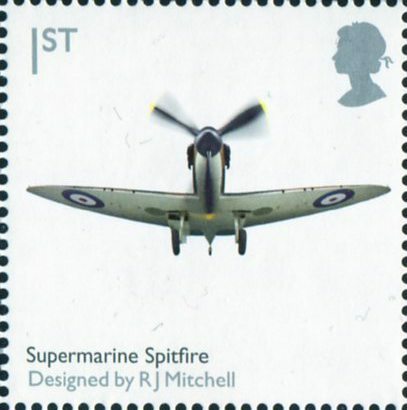 In the stamps below you can see the Supermarine Spitfire designed by Reginald Mitchell. The aircraft was light, quick and a match for the Lufwaffe’s Messerschmitt Bf 109. Although Hawker Hurricanes were used predominately by the RAF, it was the Spitfire that became the iconic symbol of British defence. 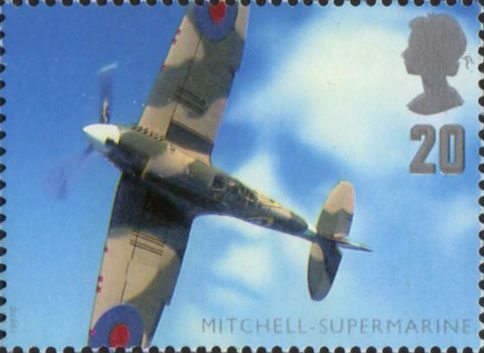 The Hawker Hurricane can be seen in the below stamp accompanied by Air Chief Marshall Sir Hugh Dowding. 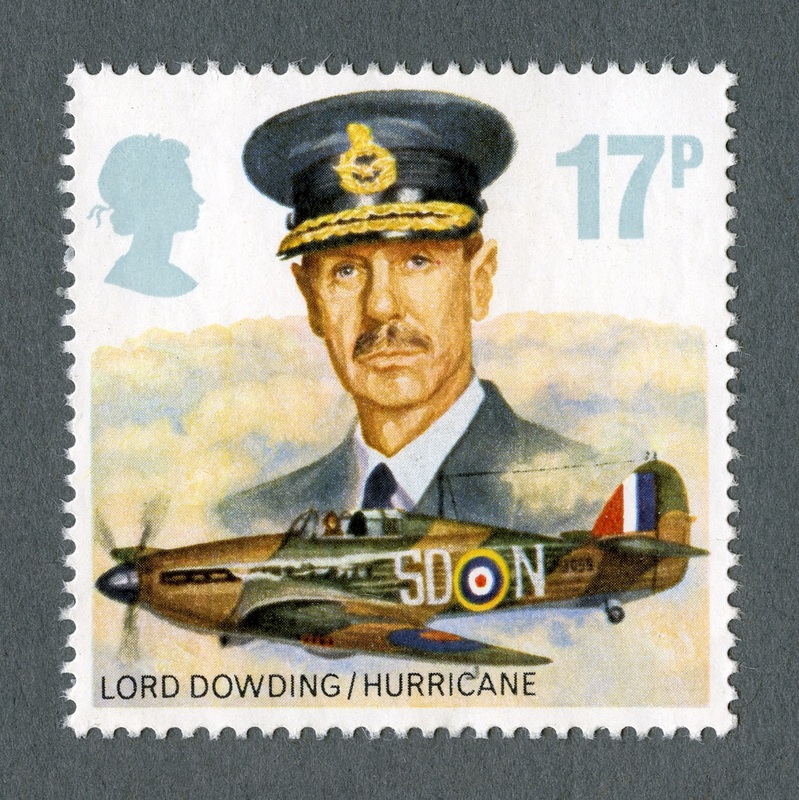 Dowding played a huge role in the success of the Battle of Britain as the Head of RAF Fighter Command. It was here that all information was collected and decisions made, ultimately winning the battle. Throughout history Britain has been at war. The stamps displayed here celebrate the dedication of those who took part and the lives of the men and women lost in the conflicts. 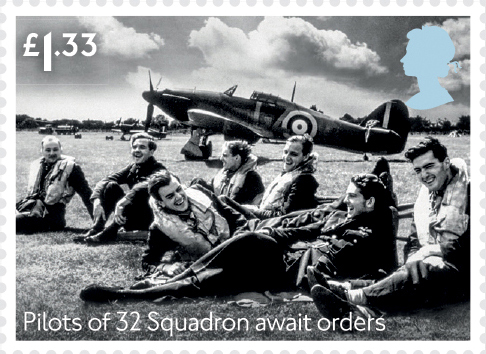 Through the medium of stamps we can circulate a message of national remembrance. Opening today at Aberdeen Maritime Museum is an exhibition of maritime stamps. The exhibition was put together for London 2010: Festival of Stamps by Aberdeen Philatelic Society, who are celebrating their centenary this year. The exhibition will run until 14th November, but the stamps on display will change approximately every 4 weeks. Amongst the topics covered are lighthouses, paquebots and Guantanomo Bay. It’s great to see Aberdeen Maritime Museum and Aberdeen Philatelic Society collaborating on this fascinating thematic exhibition. See the London 2010: Festival of Stamps website for information on many more events and exhibitions.